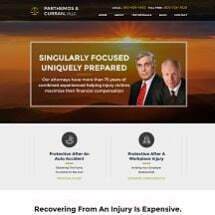 The law firm of Parthemos & Curran, PLLC, in Winchester, Virginia, is a long-standing, trusted resource for workers' compensation and personal injury representation. Attorneys at the firm apply more than 70 years of collective experience in helping victims of on-the-job accidents, car accidents and other life-changing events recover all financial compensation available to them. The firm also offers estate planning counsel and select other legal services. Each client who turns to Parthemos & Curran, PLLC, receives personal attention and focused, highly responsive legal counsel. Personal injury and workers' compensation lawyer Nikolas E. Parthemos has earned a rating of AV Preeminent* under Martindale-Hubbell's peer review system, reflecting both his proven ability to obtain excellent results and his professional integrity. He is an adept case analyst, dynamic negotiator and respected trial lawyer. Supported by caring, knowledgeable paralegals with decades of relevant experience, he actively works every injury case we pursue. We welcome client inquiries at any point after an injury-causing or fatal accident in Virginia. We stand up to workers' compensation insurers and other insurance companies in all types of disputes over claims, coverage and benefits. Whether you have suffered moderate injuries in an auto wreck or potentially career-ending work injuries, we are here to help in every way we can. Many families throughout our primary service area - covering Frederick, Shenandoah, Warren, Clarke and Loudoun counties - have relied on us across multiple generations. We are fortunate to receive many referrals from clients we have helped in the past and other attorneys who recognize our skills and relentless work ethic. For a free initial consultation, call 540-409-4492 or contact us via email anytime.